Rosanne Hewitt-Cromwell has been locked in a love affair with cake and baking for as long as she can remember, from the early days listening as her mam sang happily in the kitchen, delicious sweet smells filling the house, right up to today, standing in her very own kitchen singing and baking more treats than her poor husband can eat. 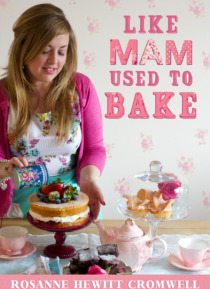 Some favourites from Rosanne's popular baking blog, Like Mam … Used to Bake, are included here alongside a whole host of new recipes from childhood memories and experiments in her kitchen. From the ever-popular mint-crisp pie, almond fingers and upside-down cake, to her addictive rocky road, there really is something to suit all tastes. Rosanne even dedicates a chapter to Christmas baking, her favourite time of year. Peppered throughout with helpful hints and strolls down memory lane, this is much more than a cookbook.